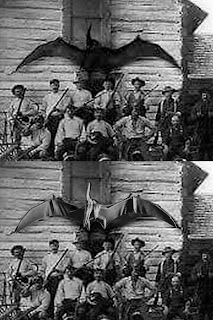 I recently noted on Facebook that I consider it very important to publicly expose and debunk fake cryptozoological photographs, because in doing so it not only prevent them from cluttering the archives of cryptozoology in the future but also prevents cryptozoological sceptics from using them as evidence for claiming that the subject is credulous and not scientifically rigorous. So with that in mind, here are another two such photos that I have recently been able to shoot down as phoneys. 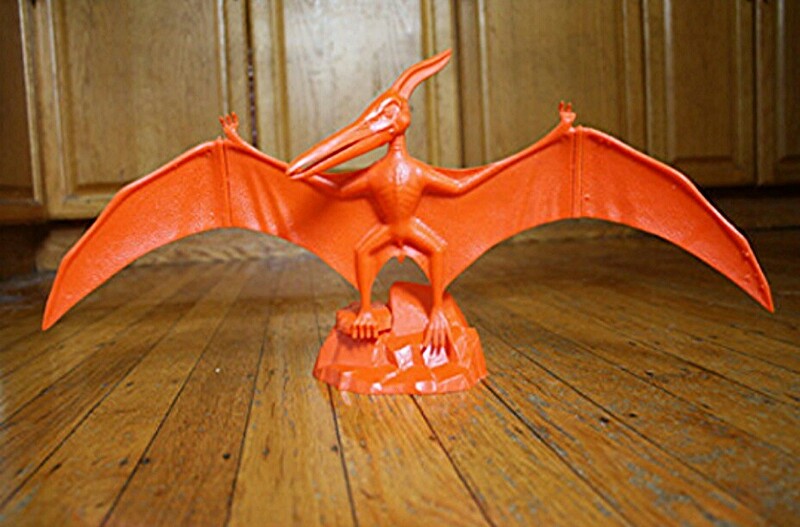 The first of these came to my attention on 12 October 2016 while I was browsing online – I first spotted it in the forums section of the Taurusarmed.net website, where it had been posted by someone with the username Moondawg on 5 June 2015, but I subsequently discovered that it had been posted by various other people on a number of other sites too. 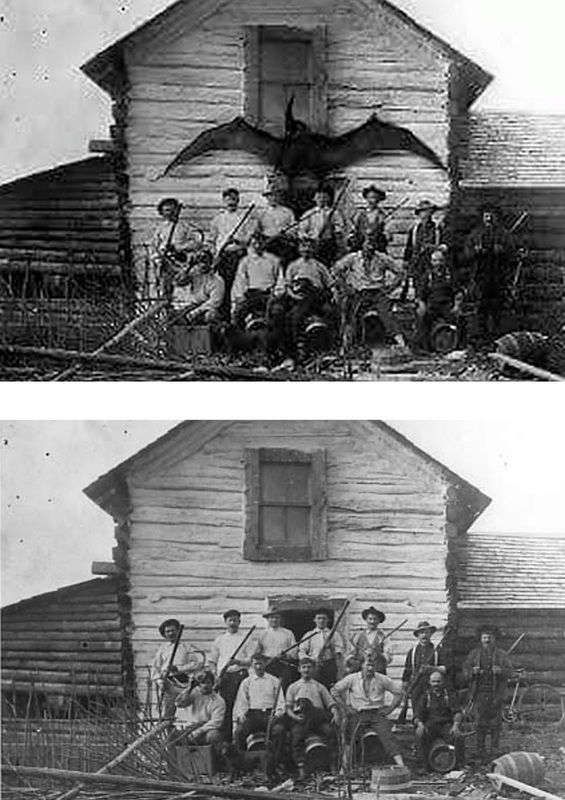 As seen here, it is a typical example of the 'shot thunderbird photograph' motif (click here for the saga of this ostensibly real but elusive image), of which numerous confirmed fake versions are still doing the rounds online, and which consist of what appears to be a vintage photo of hunters posing alongside an enormous dead winged creature, the thunderbird (aka 'big bird'), fastened with wings outstretched to a wall or barn door. 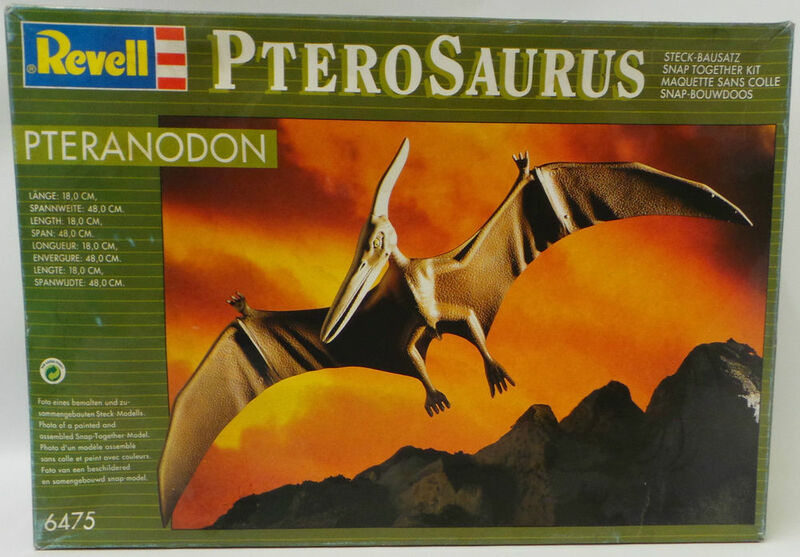 In some such photos, the thunderbird is avian, in others it is pterosaurian – it is the latter in the version under consideration here. As soon as I saw the photo, it seemed obvious to me that it was yet another fake. 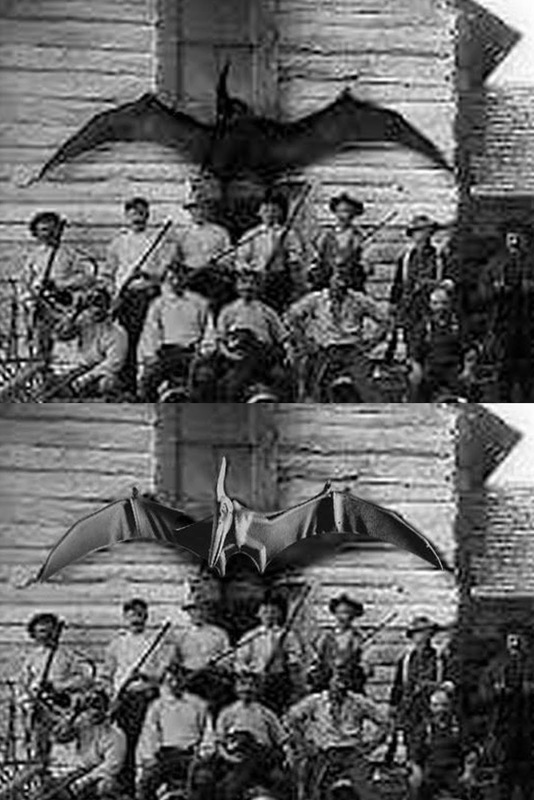 I freely confess that I am no photographic expert, but in terms of both contrast and edges the pterosaur was far sharper than anything in the remainder of the photograph. 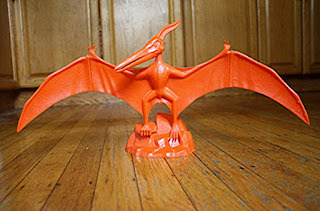 Moreover, as a zoologist I was readily aware that the pterosaur's morphology was consistent with the typical reconstruction of the American pterodactyl Pteranodon that was preponderant in books and magazines dating from the 1960s and 1970s, as opposed to ones from present-day publications and considered by present-day palaeontologists to be accurate. 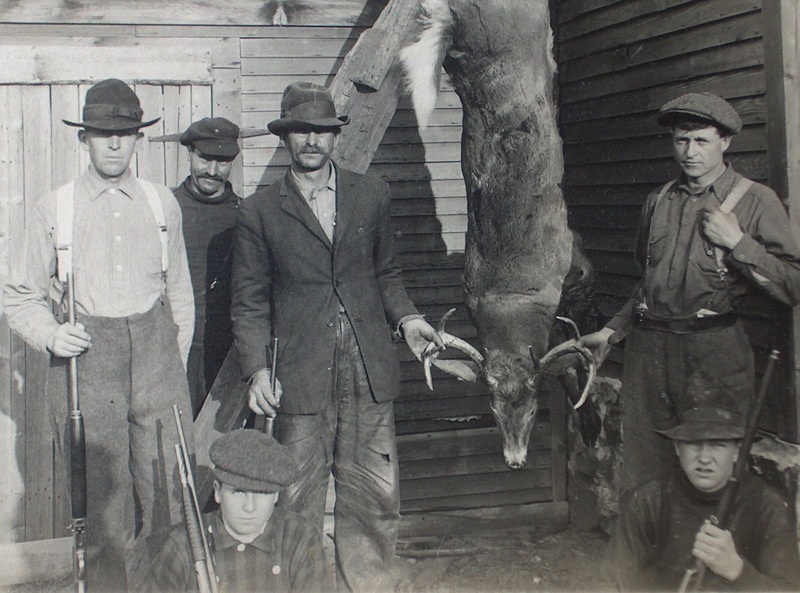 I discovered it on the Viewsofthepast.com website, on a page entitled 'Superior View Hunting & Wildlife' (click here to visit it), which contained a lengthy series of vintage hunting photos. The example that had been used as the basis for the fake thunderbird photo was listed as 'H-CAMP07 Log Cabin Hunters', and clearly dated back to at least the early 1930s, and quite possibly even earlier than that. As can be seen, the image of the Pteranodon on the lid of this model kit's box is almost identical to that of the Pteranodon in the fake thunderbird photo, and I could readily imagine that if a photo of the fully-assembled model Pteranodon were taken from slightly above the model so that its head, neck, and beak appeared slightly lower down over its body than they do in the picture on the model kit's lid, it would then correspond precisely with the fake thunderbird version. Another case of crypto-photographic forgery well and truly closed! 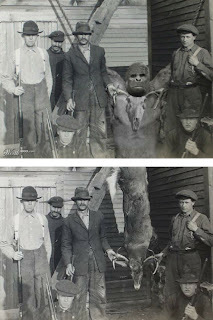 Looking at it, it seemed to me to be another vintage American hunters photo into which something foreign had been introduced – on this occasion some form of animal montage creating the supposed bigfoot, the body possibly being that of a bear, with what may be a gorilla's head (or a model of one?) 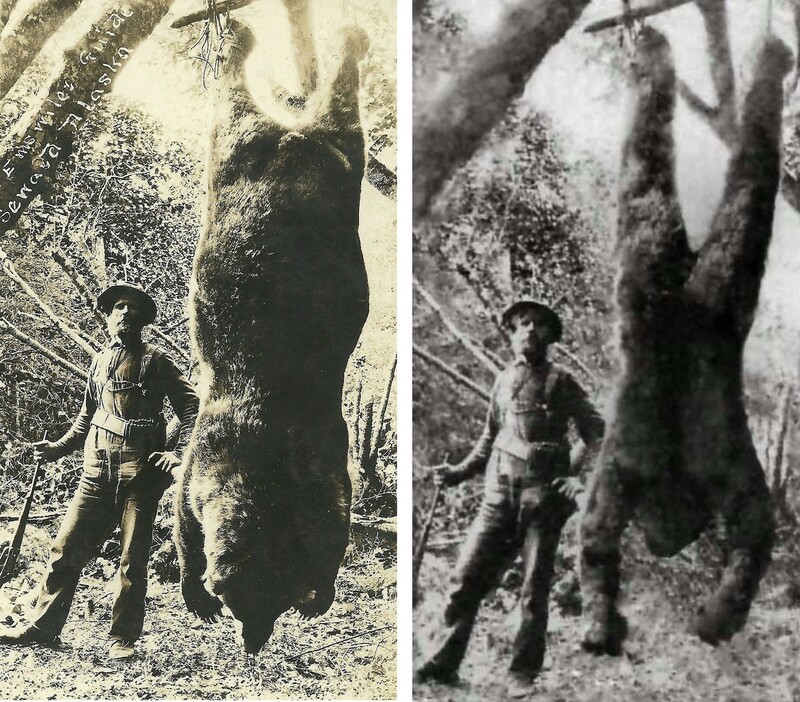 superimposed on top of it, because the head and body do not appear to be continuous (and the body not very gorilla-like anyway). For what it's worth (pardon the forthcoming pun! 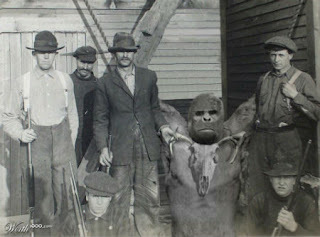 ), however, there was an additional (and totally unequivocal) clue readily visible in this 'shot bigfoot' picture that confirmed beyond any shadow of a doubt that this was indeed a phoney photograph. And that was the presence of a certain inscription in its bottom left-hand corner, reading 'Worth1000.com' – because this just so happens to be the name of a former website that specialised in competitions for producing the best photoshopped images. Pursuing this lead, I was able to confirm that the 'shot bigfoot' had indeed been submitted for one of Worth1000's competitions – specifically, its 'Monster Hoaxes 6' contest, held in early 2012; that it was Worth1000 Design #8830992; and that the person who had submitted it was based in the USA and had the username Kryptomaniacle. Click here to see this photo's official submission page. Unfortunately, I was unable to obtain further information because Worth1000.com has been taken over by the graphic design website DesignCrowd, and only its members can obtain more specific details regarding Worth1000 submissions, usernames, etc (and because this site's members need to be graphic designers, which I'm not, I'm not a member). However, Kryptomaniacle did state alongside this bigfoot-inspired photo that he/she had photoshopped it as an April Fool's joke. It came 15th out of the 27 submissions in the contest (click here to see all of the entries). Some entrants provided the original sources used in creating their submissions, but unfortunately Kryptomaniacle didn't do so. I found it on the Wideopenspaces.com website, on a page entitled 'The Good Old Days@ 30 Historic Hunting Photos [Pics]' – click here to view this page (the vintage deer hunters photo used as the basis for the 'shot bigfoot' photo is Photo #26). 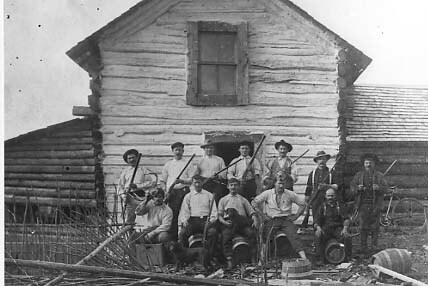 It had originally appeared in Canada's Ottawa Sun newspaper. 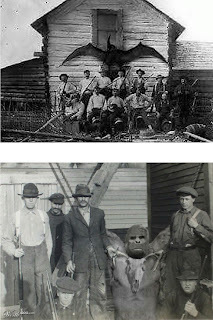 As shown below, when the original vintage hunters photo and Kryptomaniacle's fake bigfoot photo are viewed alongside one another, it can be readily seen that except for the shot deer in the former photo and the ropes-suspended 'shot bigfoot' in the latter one (plus the image of an ungulate skull positioned over the body of the 'bigfoot'), the two are identical. 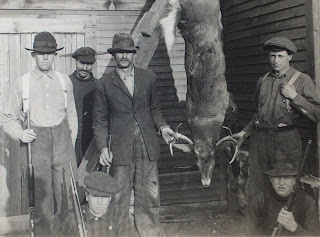 Moreover, even the ungulate skull is a composite, combining the antlers of the deer in the original vintage hunters photo with the skull from some entirely different individual (and which may actually be a cow skull rather than a deer skull anyway). All that remains to be done now in order to complete the full exposure of this 'shot bigfoot' photo's origins is to trace Kryptomaniacle's sources for the 'bigfoot' head and body, and for the ungulate skull placed over the body. Yet even if this isn't achieved, what I have already revealed here in relation to it is more than sufficient to verify the photo's fake nature. Indeed, the 'Worth1000.com' inscription should have been enough for anyone to have realised straight away that the 'shot bigfoot' photo was a phoney, which is why I was so surprised to find it the subject of serious discussion as to its possible authenticity on various websites. Having said that, I must make a clear differentiation regarding this photo between its being a fake and a hoax. Yes, it IS a fake, created by Kryptomaniacle using photoshopping techniques; but it is NOT a hoax, because it was submitted openly by Kryptomaniacle for a public photoshopping competition, with no intention to deceive, having been clearly identified by him/her as a photoshopped image. 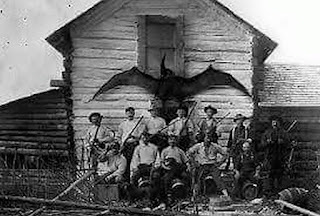 It is only because it has subsequently been uploaded by others onto various sites where it has mistakenly been thought to be real that cryptozoological confusion concerning its true origin and nature has occurred. My sincere thanks to Robert Hodge and Joseph McKee for their much-appreciated assistance in relation to my researches documented here. 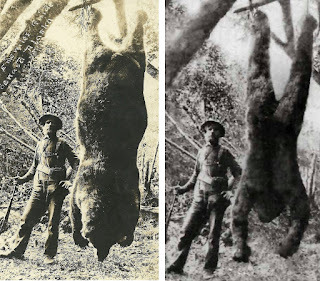 From bear to bigfoot - another fake bigfoot photograph that I debunked - click here to read all about it.